Aerospace Composites has gained importance in the past few years. Novelty has introduced a broad range of variation in the existing products escalating demand in the global aerospace composites market. Globally, the market has been mounting at an exceptional rate over the past few decades and is projected to sustain the pace in the future too. There are numerous aspects that drive the demand in global aerospace composites market. Rising demand for lightweight composite materials in aircraft production is the prime aspect of the global aerospace composites market. 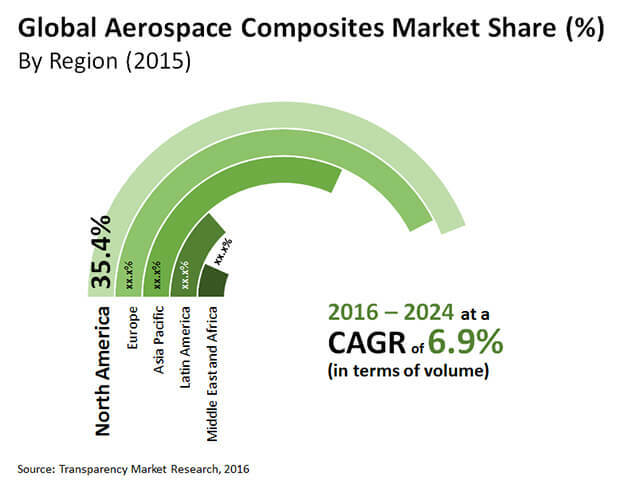 As stated by an analyst of Transparency Market Research (TMR), the global aerospace composites market was treasured at US$11.5 bn in 2015, and is projected to expand at a steady 9.1% CAGR between 2016 to 2024. The market is expected to reach US$24.8 bn by the end of 2024. Introduction of cutting-edge products attracting the eyes of youth and unique marketing approaches are garnering request in the global aerospace composites market. Further, brands will be looking at exploring new avenues in geographies to stay ahead in the market. Based on the type of products, the global aerospace composites market is divided into aramid fiber composites, carbon fiber composites, and glass fiber composites. Of this, carbon fiber composites constituted the leading product-based segment, with a volume share of nearly 53% in the overall market in 2015. At the moment, composites are manufactured via autoclave process majorly. This process utilizes pressurized vessels at high temperature to producing composite materials. However, the autoclave process is extensively adopted in production process, it requires substantial time for processing, cost, and energy. This increases the global cost of the composite material manufactured. On the basis of applications, the global aerospace composites market is divided into commercial & business aircraft, military, helicopters, and space. Among these, the aircrafts, helicopters and space are likely to remain dominant in the market in the coming years. Composites are ever more utilized in the exterior of aircraft with an aim to control the possible of composites including abrasion resistance, lightweight, and corrosion resistance. In terms of geography, the global aerospace composites market has been segmented into North America, Asia Pacific, Europe, Latin America and Middle East & Africa. In terms of demand, North America is expected to lead the global aerospace composites market in the coming years. The regional market was followed by its counterparts in Europe, Asia-Pacific, Latin America and Middle East & Africa. The aerospace composites market in India is highly competitive with the existence of a few companies currently. It is projected that the growth of the market may attract global enterprises to enter the Indian market in the forthcoming years to capture a larger chunk of the growing aerospace composites market. Furthermore, it is also projected that the current enterprises may create better technological proficiencies in the future to remain in competition for long run. Some of the key players in the global aerospace composites market are Toray Industries Inc., Huntsman International LLC, Hexcel Corporation, SGL-The Carbon Company, and Cytec Solvay Group. Aerospace composites are the composite material systems which find applications in the aviation industry due to their key chemical and mechanical properties. The composite materials commonly used in the aerospace industry are carbon fiber composites, glass fiber composites and aramid fiber composites. Application segments of global aerospace composites include commercial & business aircraft, helicopters, military and space. Carbon fiber composites are the commonly used composite material in the aerospace industry due to high fuel efficiency and low carbon emission. Increasing air passenger traffic, emerging economies and growing number of low cost carriers are expected to boost the market. Recent trend of spending heavily on military and space programs are expected to fuel the growth of the aerospace market in near future. The report estimates and forecasts the aerospace composites market on the global, regional, and country levels. The study provides forecast between 2016 and 2024 based on volume (Tons) and revenue (US$ Mn) with 2015 as the base year. The report comprises an exhaustive value chain analysis for each of the product segments. It provides a comprehensive view of the market. Value chain analysis also offers detailed information about value addition at each stage. The study includes drivers and restraints for the aerospace composites market along with their impact on demand during the forecast period. The study also provides key market indicators affecting the growth of the market. The report analyzes opportunities in the aerospace composites market on the global and regional level. Drivers, restraints, and opportunities mentioned in the report are justified through quantitative and qualitative data. These have been verified through primary and secondary resources. Furthermore, the report analyzes global average price trend analysis of aerospace composites. The report includes Porter’s Five Forces Model to determine the degree of competition in the aerospace composites market. The report comprises a qualitative write-up on market attractiveness analysis, wherein application and countries have been analyzed based on attractiveness for each region. Growth rate, market size, raw material availability, profit margin, impact strength, technology, competition, and other factors (such as environmental and legal) have been evaluated in order to derive the general attractiveness of the market. The report comprises price trend analysis for aerospace composites between 2016 and 2024. The study provides a comprehensive view of the aerospace composites market by dividing it into product type, application and geography. The aerospace composites market has been segmented into carbon fiber composites, glass fiber composites, aramid fiber composites and others. Application segments have been analyzed based on commercial & business aircraft, military, helicopters and space .The aerospace composites market has been estimated in terms of volume (Tons) and revenue (US$ Mn) between 2016 and 2024. The report covers detailed competitive outlook that includes market share and profiles of key players operating in the global market. Key players profiled in the report include Cytec Solvay Group, Hexcel Corporation, Koninklijke TenCate, Toray Industries Inc., BASF SE, SGL-The Carbon Company. Company profiles include attributes such as company overview, number of employees, brand overview, key competitors, business overview, business strategies, recent/key developments, acquisitions, and financial overview (wherever applicable).